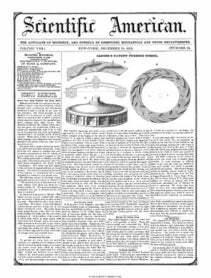 Henry Waterman, of Williamsburgh, L. I., has taken measures to secure a patent for lin improved steam boiler. The chief object of this invention is to provide a means of reliev ing the boiler of dangerous pressure without a great loss of steam and without materially or even at all interrupting its proper opera tion. This is effected by placing on the top of the boiler a cylindrical vessel which the inventor terms a safety-chamber. The said vessel is separated from communication with the steam in the boiler by a metal plate (cop per is preferable) which is sufficiently strong to bear the pressure of the steam up to the maximum that may be desired. But if the steam should exceed that pressure it will cause the plate to tear asunder and the steam will rush into the safety chamber, when the pressure will be at once reduced; and as the inventor proposes to make this chamber with a capacity equal to the amount of steam space in the boiler, the pressure of the steam will be reduced one half. From the fact that the water would be likely to foam up into the safety-chamber as the steam rushes in, ano ther plate of the same strength as the boiler is connected to the before-mentioned satety- plate, the only way by which the steam can pass from the boiler to the under side of the litter being through a small&apos; pipe provided with a faueet. Supposing that the steam has rent the safety plate and rushed into the cham ber, it then sounds a whistle, which informs the engineer of the occurrence : &apos; the pressure being by this time reduced, he closes the com munication between the boiler and chamber, allows the steam in the latter to escape, and replaces the torn safety-plate by a new one, for which purl?ose he is always provided with two or three spare plates.